On one of the last days of the year I cycled around Amsterdam with two other bloggers. Doug Gordon or BrooklynSpoke from New York and Marc van Woudenberg better known as Amsterdamized. I highly recommend both their blogs and it is always nice so meet fellow bloggers so when Doug asked if we could meet we quickly got to a date for a ride. As Doug’s camera broke he didn’t have a souvenir to take home. Marc came to the rescue with a great video capturing the relaxed afternoon perfectly. Note how everything that makes cycling typical in Amsterdam just comes along. Point and shoot and you catch things like the saddle side hop, guys with headphones texting on their smartphone and people with children on their bikes front and back. Leave it up to Marc to wrap everything in a great video! It is always hard for people to imagine that Amsterdam was very different in the past. These streets didn’t become so people friendly by themselves. In the 1960s and 1970s and even up to the 1980s Amsterdam was filled with cars up to the last alley. So I took some stills and went to the city archive website and it is very easy to find examples of the same street when the car still reigned in Amsterdam. Staalstraat 1980s, not very people friendly! Staalstraat 2012, a cycle street closed to motorized traffic. You can easily see in which situation shops flourish better! Nieuwmarkt 2012 a great square for a stroll or a coffee on one of the terraces. There is much more information on how the Dutch changed their cities when you search with the tag ‘history‘ on my blog. Marc, can you switch off these snowflakes in your site? Because of them site becomes unusable: processor usage rises (no processing power left for video rendering), scrollbars bounce. Maybe with some other browser your site looks OK, but with Firefox it’s a mess. After a recent Los Angeles County Metro Bicycle Roundtable meeting ended, I talked to a traffic engineer from the Los Angeles region who had visited Amsterdam in the 1980’s. He previously told me at the ThinkBike workshop in Los Angeles, put together by the Dutch Embassy, that he didn’t remember seeing many bike paths there. While in Amsterdam, he asked, “Where are the bicycles?” It turned out that bicycles were mainly in the outer portions of the city. Two weeks before the Metro meeting, he had just returned from the Netherlands to study bicycle infrastructure and his view of bicycling in Amsterdam is quite different now, as demonstrated by the pictures and video. I can’t believe Nieuwmarkt. Having eaten there and ridden past many times, it seems outrageous to fill that “plaza” with the thing that kills any people-friendly space. Great post (video is just too cool for school AMS’ize and BS). Might send this around to my work colleagues as we’re hosting the ECF Velo conference in 2014 and at this stage our showcase bike infra is two intersections with advanced stop lines (and of course Australia’s MHL). Wonderful afternoon despite the long shadows in Amsterdam this time of year. Alas we got a big dump of snow here in Montréal so no cycling until it is cleared out. Great seeing Marc, BrooklynSpoke Doug and you tooling about. Did Brooklyn manage to get to the town of Breukelen? Indeed Amsterdam didn’t become cyclable – or win back space for humans from the postwar car boom – all by itself. 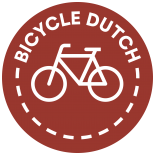 This entry was posted on 31 December 2012 by Bicycle Dutch in Original posts and tagged Amsterdam, history, watching people cycling.